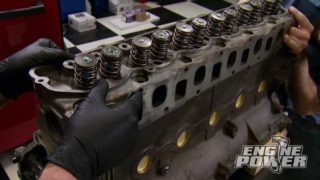 Mike and Pat set up GM's LQ4 and Ford's Windsor with comparable parts, to find out which one makes more power! Cometic MLS head gaskets are constructed from multiple layers of stainless steel for strength and contain load-controlled embossments that conform load distribution across the sealing area. MSD 8.5mm Super Conductor spark plug wire sets feature a special helically wound core that has just 40-50 ohms of resistance per foot—but with an RFI suppression equal to a 1,500 ohm wire. Designed for engine builders, Royal Purple break-in oil is formulated to allow optimal ring seal and protect rotating assembly components such as the camshaft and valvetrain from initial start-up wear. These one-piece, centerless-ground 4130 chrome molybdenum pushrods are designed for use in oval track race cars; drag race cars; hot rods, including sport compacts and marine applications. (NARRATOR)>> THE FORD WINDSOR AND GENERAL MOTORS' LS ARE TWO ESTEEMED ENGINES. 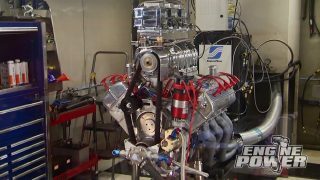 TODAY ON ENGINE POWER, AFTER COMPARABLE UPGRADES WE'LL PUNISH THEM ON THE DYNO TO SEE WHICH ONE PUTS OUT THE MOST HORSEPOWER AND TORQUE. 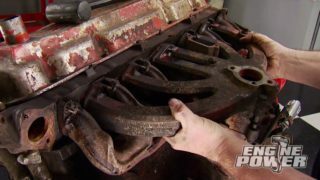 (MIKE)>> WE'RE BACK WITH MORE ENGINE TECH FOR TODAY'S EPISODE. IT'S A LITTLE SERIES WE'RE CALLING TAKE OUT TECH. THIS WILL BE PART TWO, AND IT'S ALL ABOUT FORD'S 351 WINDSOR PLATFORM GOING HEAD TO HEAD WITH A SIX LITER LS THAT YOU SAW IN PART ONE. (PAT)>> THAT INVOLVED DYNOING THE ENGINE IN MOSTLY STOCK CONFIGURATION EXCEPT FOR THE INTAKE AND CARB. WE ADDED PERFORMANCE PARTS ALONG THE WAY AND SHOWED YOU THE GAINS FOR EACH ADDITION. THEN WE DID A LITTLE SOMETHING OUT OF THE NORM BY BOLTING ON A SET OF CYLINDER HEADS BEFORE DOING A CAM SWAP TO SHOW YOU WHAT AIR FLOW IMPROVEMENTS ARE POSSIBLE. LET'S HAVE A LOOK AT THE PROCESS OF THIS SIX LITER. 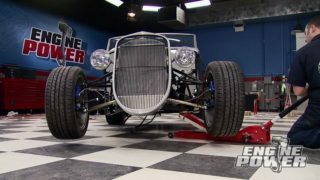 (MIKE)>> WE DYNO'ED THE ENGINE FOR A BASELINE WITH A DUAL PLANE MANIFOLD AND OUR HOLLEY 650 CFM DYNO CARB. (PAT)>> THAT ACTUALLY SPIT OUT A BIG NUMBER RIGHT THERE. THAT DID EXACTLY WHAT IT WAS SUPPOSED TO DO! 511 HORSE, 454 POUND FEET TORQUE. THAT WAS PART ONE. PART TWO IS GONNA PUT THIS FIVE POINT EIGHT LITER 351 WINDSOR FORD UP AGAINST THAT SIX LITER LS, AND HERE IS WHERE IT'S GONNA GET INTERESTING. 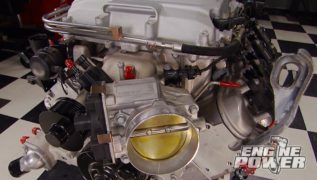 THE PARTS THAT WE ORDERED FOR THIS ENGINE ARE AS CLOSE AS WE COULD GET TO THE LS' BUILD LIST SPEC WISE, AND AS WE PROGRESS WITH THIS FORD WE'RE GONNA SHOW YOU A SIDE BY SIDE COMPARISON FOR EACH PART INSTALLED. SO ALTHOUGH TECHNICALLY IT'S CALLED "TAKE OUT TECH PART 2", IN ACTUALITY IT'S A LITTLE BIT OF A BATTLE OF THE BRANDS. (MIKE)>> THIS 351 CONFIGURATION WAS USED IN '94 THROUGH '97 BRONCOS, VANS, F-150'S, 250'S, AND 350'S. IT HAS A HYDRAULIC ROLLER VALVETRAIN. THE DECK HEIGHT IS NINE POINT FIVEZEROTHREE INCHES, AND THE BLOCK IS CAST IRON. THE BORE MEASURES IN AT FOUR INCHES, AND THE STROKE IS THREE AND A HALF. 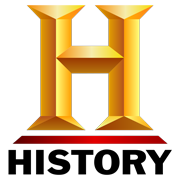 IN THE '94 MODEL YEAR THIS ENGINE MADE 2000 HORSEPOWER AND 310 POUND FEET OF TORQUE WITH THE EIGHT POINT EIGHT TO ONE COMPRESSION RATIO. WE'RE GOING TO DYNO THIS 351 WINDSOR IN STOCK FORM WITH THE SAME EXACT PROTOCOL THAT WE USED WITH THE SIX LITER. A DUAL PLANE MANIFOLD, THE SAME 650 CFM CARB, AND STOCK ROCKER ARMS. 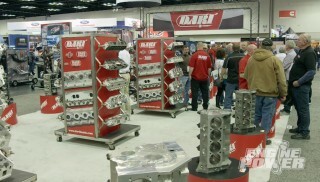 NOW WE ORDERED ALL THESE PARTS FROM SUMMIT RACING IN SEVERAL DIFFERENT BRANDS. KEEP IN MIND, WE ORDERED THEM WITH SPECS VERY, VERY SIMILAR TO THE SIXZERO'S. 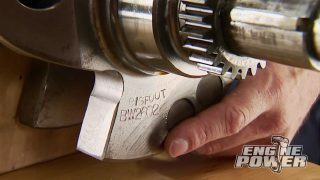 (PAT)>> WE PICKED UP THIS LONG BLOCK ASSEMBLY FROM POWERTRAIN PRODUCTS, AND IT'S GONNA REPRESENT A TAKEOUT ENGINE THAT WAS RUNNING FOR ONE OF YOUR PROJECTS, AND WE'VE USED THEIR ENGINES IN SEVERAL OF OUR PREVIOUS TECH PIECES AND THEY'VE ALWAYS RAN GREAT. THEY GO THE EXTRA STEP AND FIX KNOWN ISSUES IN CERTAIN APPLICATIONS, AND THEIR QUALITY CONTROL IS EXCELLENT. (MIKE)>> THE FIRST STEP TO GETTING THIS ENGINE DYNO READY IS INSTALLING THE ALL STAR PERFORMANCE TIMING COVER. IT'S AN EARLY STYLE WHICH HAS A FUEL PUMP MOUNTING BOSS AND DIPSTICK TUBE OPENING. LIKE EVERY ENGINE WE BUILD, ARP FASTENERS WILL BE USED. (PAT)>> THIS IS A STANDARD VOLUME MELLING OIL PUMP THAT WAS SUPPLIED WITH THE ENGINE. WE'LL HOOK IT TO THE BLOCK WITH ARP FASTENERS AND TURN IT WITH AN ARP DRIVESHAFT. 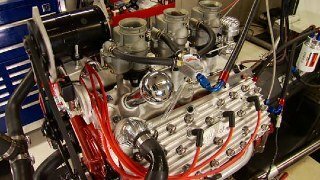 (MIKE)>> WE CHOSE A BUDGET FRIENDLY SUMMIT RACING ENGINE SWAP PAN. ITS PURPOSE IS TO PUT A 351 WINDSOR IN A FOX BODY MUSTANG. IT HOLDS FIVE QUARTS OF OIL, COMES WITH THE OIL PUMP PICK UP, AND IS PAINTED BLACK. THIS PAN WILL NOT WORK WITH HIGH VOLUME OIL PUMPS. (PAT)>> NEXT TO GO ON IS A SUMMIT RACING BRACKET RACER HARMONIC DAMPER. IT IS SFI APPROVED, HAS DEGREE MARKS, AND CAN BE USED AS EITHER A NEUTRAL BALANCE OR 28 OUNCE IMBALANCE. IT'S BEEN SPIN TESTED TO 12,500 RPM AND IS A BIG VALUE AT ONLY $159 BUCKS. THIS MAY GIVE AWAY WHAT CYLINDER HEADS WE ARE SWAPPING TO FURTHER IN THE COMPARO. TRICK FLOW'S SHEET METAL VALVE COVERS ARE MADE FROM ALUMINUM. THESE ARE THE TALL VERSIONS WITH A THREE AND SEVENEIGHTHS OVERALL HEIGHT. THEY WILL CLEAR ROLLER ROCKERS AND STUD GIRDLES. (PAT)>> 242 HORSEPOWER, 344 POUND FEET OF TORQUE. NOW IF YOU NOTICE THE PULL WAS ONLY FORM 2,500 TO 5,000, AND THE REASON IS WHEN I WAS MAKING PULLS TO FIND A HIGHER RPM THIS WAS ACTUALLY FLOATING THE VALVES, PRETTY COMMON. THESE ENGINES AREN'T MADE FOR HIGH RPM. SO HEY, IT IS WHAT IT IS. HERE'S THE NUMBERS ON OUR TWO COMPARISON ENGINES. IN BASELINE CONFIGURATION THE LQFOUR HAS 124 HORSEPOWER ADVANTAGE, AS WELL AS 72 POUND FEET OF TORQUE MORE THAN THE WINDSOR, BUT DON'T LET THAT SWAY YOU JUST YET. SOME IMPRESSIVE UPGRADES ARE IN STORE FOR THE FORD. (NARRATOR)>> AND THOSE UPGRADES INCLUDE A LITTLE MORE LIFT WITH THE HELP OF SOME ROCKERS AND A SET OF GREAT FLOWING CYLINDER HEADS. (PAT)>> THAT IS A POWER GAIN RIGHT THERE. 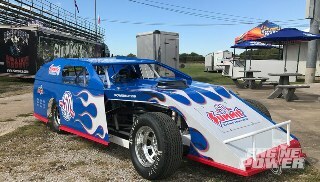 NEW NUMBER FOR JUST THE ROCKER CHANGE, 257 HORSE, 356 POUND FEET OF TORQUE. DEFINITE GAIN, AND THAT DOESN'T TELL THE WHOLE STORY ON JUST THE PEAK NUMBER. THE AVERAGE POWER IS SIGNIFICANTLY BETTER. ALTHOUGH THE PEAK NUMBER ONLY INCREASED BY 15 HORSEPOWER THE POWER AND TORQUE INCREASE FROM 3,200 TO 5,000 RPM TELLS THE REAL STORY. ABOVE 4,400 RPM THE INCREASE IS 20 OR MORE HORSEPOWER ALL THE WAY TO THE END OF THE PULL. THAT'S ALMOST A 10 PERCENT GAIN FOR A 20 MINUTE JOB. NOW WE'RE LOOKING FOR BIGGER GAINS BY INCREASING THE AIR FLOW IN A BIG WAY. 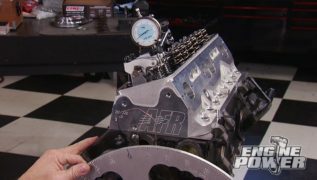 (MIKE)>> THIS IS TRICK FLOW'S HIGH PORT 225cc CYLINDER HEAD FOR SMALL BLOCK FORDS. 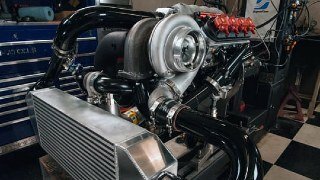 NOW THE SPECS ARE REALLY CLOSE TO THE GENX 225 WE RAN ON THE LS ENGINE. THE INTAKE VALVE MEASURES IN AT TWOZERO-80. THE EXHAUST VALVE IS AN INCH-600. NOW THE COMBUSTION CHAMBER IS CNC MACHINED AND MEASURES IN AT 58cc. THE EXHAUST PORT IS RAISED 750 THOUSANDTHS, IS A SQUARE PORT, AND IT'S VOLUME IS 95cc. THE INTAKE RUNNER VOLUME IS 225, AND THAT'S WHERE THIS HEAD GETS ITS NAME. NOW HERE'S A QUICK LOOK AT THE FLOW NUMBERS BETWEEN THESE TWO HEADS. (PAT)>> COMPARED TO THE GENX 225 LS HEADS, THE HIGH PORT FORD HEADS FLOW VERY SIMILAR NUMBERS THROUGHOUT THE ENTIRE LIFT RANGE. THEY ARE WITHIN A FEW CFM WHEREVER YOU LOOK. WE PICKED THESE HEADS SPECIFICALLY BECAUSE THEY ARE THE CLOSEST WE COULD GET TO THE GENX 225'S FLOW NUMBERS. WITH A COMETIC MLS 27 THOUSANDTHS THICK GASKET ON THE DECK AND OUR CALCULATIONS COMPLETE, WE HAVE A FINAL COMPRESSION RATIO OF NINE POINT THREESIX TO ONE. QUITE A DIFFERENCE FROM THE 10.63 TO ONE ON THE LQFOUR ENGINE. (MIKE)>> ARP HEAD BOLTS ARE TORQUED TO 100 POUND FEET. MAKE SURE TO ACHIEVE THAT IN MULTIPLE STEPS. DUE TO THE RAISED EXHAUST PORT LOCATION THE HEADERS WE USED PREVIOUSLY WILL NOT WORK. THE GOOD NEWS WE HAVE A SET OF DYNO HEADERS WITH THE SAME TUBE DIAMETER, LENGTH, AND COLLECTOR SIZE. OKAY GUYS, THE PROTOCOL IS THE SAME. WE'RE GONNA DYNO THIS THE SAME WAY WE DID THE LS, WITH AFTERMARKET CYLINDER HEADS, STOCK CAM SHAFT, AND ROCKER ARMS. NOW ONE THING BEFORE WE START THE ENGINE, HEY PAT. TELL ME WHAT HAPPENED TO THE EYE. (PAT)>> I WISH I HAD A GOOD STORY, BUT I BROKE A BLOOD VESSEL IN THE EYE AND I DON'T KNOW HOW IT HAPPENED. IT JUST HAPPENS TO OLD PEOPLE! (MIKE)>> I THOUGHT YOU WE'RE GONNA TELL ME, LIKE, LOOK AT THE OTHER GUY, OR YOU WERE PICKING UP A SHORT BLOCK OR SOMETHING. (PAT)>> I WISH IT WAS THAT COOL, BUT UNFORTUNATELY NO. (PAT)>> THAT IS A SIGNIFICANT IMPROVEMENT. 344 HORSE, 398 POUND FEET OF TORQUE. (MIKE)>> QUITE A BIG INCREASE. (PAT)>> THAT'S A HUGE INCREASE AND THAT'S WITH A STOCK CAM. THE STOCK CAMS IN THESE THINGS ARE VERY, VERY MILD, VERY SMALL. OBVIOUSLY NOT MADE TO REALLY BE CRANKED ON. SO THAT IS SUPER IMPRESSIVE. (MIKE)>> WHEN WORKING IN THE GARAGE REGULAR KITCHEN STYLE PAPER TOWELS JUST WON'T CUT IT. YOU NEED SOMETHING THAT WILL HANDLE THE SERIOUS DIRT, GREASE, GRIME, AND SOLVENTS. SCOTT'S HEAVY DUTY SHOP TOWELS WILL WIPE UP THE COMPETITION. THESE ARE THREE TIMES STRONGER WHEN WET THAN SCOTT'S ORIGINAL SHOP TOWELS. THEY'RE SOLVENT RESISTANT, AND REUSABLE. NOW THEY'RE ALSO MADE FROM HYDRO KNIT MATERIAL TECHNOLOGY, MAKING THEM A GREAT ADDITION TO YOUR GARAGE OR SHOP. PICK SOME UP AT YOUR FAVORITE AUTO PARTS RETAILER. HAVING MORE POWER AND BEING ABLE TO CONTROL IT ON YOUR VEHICLE IS ALWAYS A PLUS. SCT HAS BEEN IN THE POWER PROGRAMMING BUSINESS FOR QUITE SOME TIME. THIS IS THE NEW BDX PROGRAMMER THAT DELIVERS STREET TESTED DYNO PROVEN TUNE FILES DESIGNED BY SCT'S EXPERT CALIBRATORS. IT CAN DATA LOG AND ADJUST POWERTRAIN PERFORMANCE WHEN YOU NEED IT MOST. UP TO 20 TUNE FILES CAN BE STORED AND IT HAS WIFI. SO TUNES CAN BE SENT TO YOUR DEVICE FROM THE TUNER VIA THE CLOUD. IT'S GOT A SLEEK DESIGN AND A FULL COLOR DISPLAY. GET YOURS AT SUMMIT RACING DOT COM. (NARRATOR)>> UP NEXT, TRIPLE DIGIT HORSEPOWER GAINS! (MIKE)>> OUR NEW CAM IS A NIGHT AND DAY COMPARISON TO THE FACTORY ONE. DURATION AT 50 THOUSANDTHS LIFT IS 236 ON THE INTAKE AND 248 ON THE EXHAUST. THE LSA IS 110 DEGREES. LIFT WITH THE ONESEVEN ROCKER IS 610 THOUSANDTHS ON THE INTAKE, 632 ON THE HOT SIDE. THAT'S WELL OVER 200 THOUSANDTHS MORE LIFT AT THE VALVE. A TRICK FLOW BILLET DOUBLE ROW TIMING SET IS GOING ON. NOW THE TIE BAR ROLLER LIFTERS DROP IN, AND TRENT PERFORMANCE PUSH RODS WITH A SEVEN-900 LENGTH REST IN THE LIFTER CUPS. 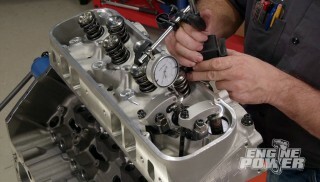 (PAT)>> THE EDELBROCK MANIFOLD IS MATED BACK UP, AND THE SAME ROCKERS ARE SET UP WITH A QUARTER TURN PAST ZERO LASH. THIS IS THE GRAND FINALE, THE COUPDEGRA. (MIKE)>> THIS IS GONNA BE INTERESTING CAUSE THIS THING SOUNDS WICKED. (MIKE)>> 448, 423, VERY, VERY NICE! (PAT)>> THAT IS NOT BAD RIGHT THERE. NOW OKAY, SO WE DIDN'T CRACK 500. I WASN'T EXPECTING TO. IT'S UP AN AMAZING AMOUNT OF POWER FOR WHAT IT IS. 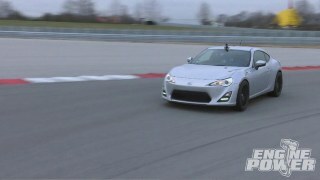 (MIKE)>> IT'S OVER 100 HORSEPOWER WITH THE CAM SWAP. (MIKE)>> PERCENTAGE WISE THIS THING SLAUGHTERED THE LS, BUT THAT GOES BACK TO SAYING, THE LS HAD BETTER PARTS FROM THE FACTORY. THE GM GUYS DID THEIR, YOU KNOW, JOB AT ENGINEERING, AND IT WAS AN OPTIMIZED ENGINE COMPARED TO THE 351. (PAT)>> YEAH, I'LL TELL YOU WHAT. THIS WAS BUILT IN THE '60'S. THE LS WAS BUILT IN MODERN TIMES, BUT SPECTACULAR. THAT IS A HUGE AMOUNT PERCENTAGE WISE. (MIKE)>> WE NEED TO LOOK AT SOME NUMBERS. (PAT)>> WE NEED TO LOOK AT SOME NUMBERS FOR SURE. (MIKE)>> THE LQFOUR STARTED OUT A BETTER ENGINE WITH 366 HORSEPOWER AS A BASELINE. ADDING THE ROCKERS PICKED UP NINE HORSEPOWER TO 375. ADDING CYLINDER HEADS BUMPED IT UP 41 HORSEPOWER TO 416, AND THE NEW CAM GAINED AN IMPRESSIVE 95 HORSEPOWER TO GET A FINAL OUTPUT OF 511. A TOTAL PEAK HORSEPOWER GAIN OF 145 HORSEPOWER. 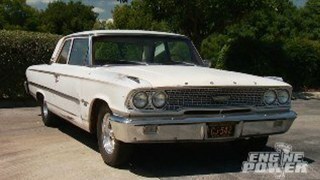 (PAT)>> ALTHOUGH THE WINDSOR STARTED OUT SIGNIFICANTLY LOWER AT 242 HORSEPOWER, EVERY MODIFICATION PICKED UP BIG POWER. THE ROCKERS GAINED 15 HORSEPOWER FOR A PEAK OF 257. 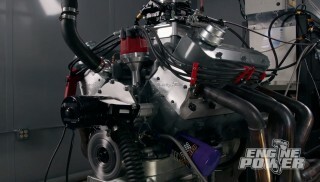 THE NEW HEADS CRANKED IT UP A BUNCH AT 87 HORSEPOWER TO TOP OUT AT 344 HORSEPOWER. THEN THE BIG KICKER WAS THE NEW CAM, WHICH ADDED A WHOPPING 104 HORSEPOWER TO FINISH OFF THIS VINTAGE DESIGNED FORD AT 448 HORSEPOWER. THAT'S A GAIN OF AN ASTOUNDING 206 HORSEPOWER AT PEAK. 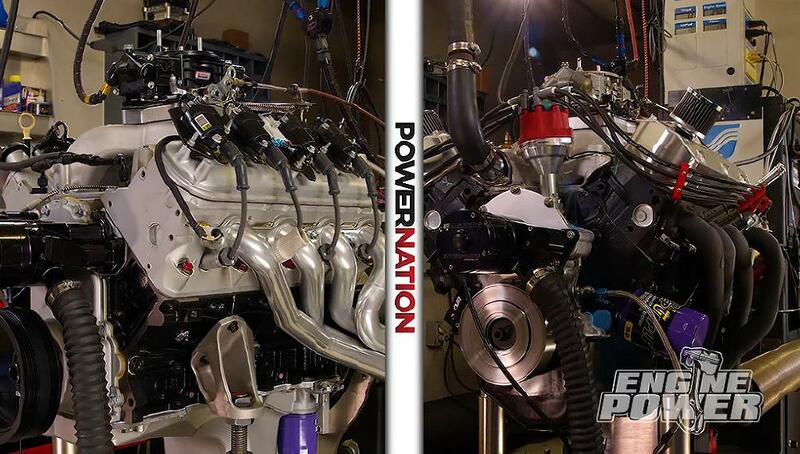 (MIKE)>> THE UPGRADES FOR BOTH OF THESE ENGINES PRODUCED GREAT POWER GAINS FOR THE MONEY INVOLVED. IT GOES TO SHOW YOU DON'T HAVE TO PUT A POWER ADDER ON TO MAKE BIG STEAM. TO FIND OUT MORE INFORMATION ABOUT THESE PRODUCTS OR ANYTHING ELSE YOU'VE SEEN TODAY ON THE SHOW VISIT POWERNATION TV DOT COM. (PAT)>> RECENTLY WE DISCUSSED COMPRESSION RATIO AND HOW IT EFFECTS PERFORMANCE TODAY WE ARE GONNA SHOW YOU HOW TO CALCULATE COMPRESSION RATIO FOR YOUR OWN POWER PLANT. TO DETERMINE COMPRESSION RATIO WE MUST MAKE FIVE VOLUME MEASUREMENTS. TO KEEP THINGS ORGANIZED WE'LL RECORD EACH ONE ON A SHEET. WE'LL START WITH THE CYLINDER VOLUME AT BDC. SINCE WE KNOW THAT THE BORE IS FOUR-125 AND THE STROKE IS FOUR INCH, WE JUST PLUGGED THEM INTO THE EQUATION FOR THE VOLUME OF THE CYLINDER. .7854 TIMES BORE SQUARED, TIMES THE STROKE, TIMES 16.39. THIS EQUATION CONVERTS THE RESULT FROM CUBIC INCHES TO CUBIC CENTILITERS. WE DO THIS BECAUSE OUR EQUIPMENT IS DESIGNED TO MEASURE IN METRIC VOLUMES. OUR RESULT IS 876.15 CENTILITERS. THE SECOND MEASUREMENT IS COMBUSTION CHAMBER VOLUME. MOST MANUFACTURERS WILL LIST THIS ON THEIR SPEC SHEET, BUT IF THERE'S ANY DOUBT YOU CAN MEASURE IT YOURSELF. WITH THE VALVES INSTALLED AS WELL AS THE CORRECT SPARK PLUG, A CLEAN ACRYLIC PLATE IS SEALED OVER THE COMBUSTION CHAMBER WITH A LITTLE BIT OF ENGINE ASSEMBLY LUBE. WITH THE BARRETTE IN PLACE OVER THE HOLE IN THE PLATE, IT IS PRECISELY FILLED TO 100cc. THEN IT'S SLOWLY DRAINED INTO THE CHAMBER UNTIL THE CHAMBER IS FULL WITH NO AIR BUBBLES. AND LOOK AT THAT. WE'LL CHECK THE READING ON THE BARRETTE. OUR RESULT IS 69cc. THE THIRD MEASUREMENT IS HEAD GASKET VOLUME. THE MANUFACTURER WILL PROVIDE THE BORE AND COMPRESSED THICKNESS OF THE GASKET, AND WE'LL USE THOSE NUMBERS MUCH LIKE WE DID WHEN MEASURING THE CYLINDER VOLUME. WITH A FOUR-200 BORE AND 40 THOUSANDTHS COMPRESSED THICKNESS, THIS YIELDS A GASKET VOLUME OF NINE POINT ZEROEIGHT CC'S. THE FOURTH MEASUREMENT IS CYLINDER VOLUME AT TDC. THIS MEASUREMENT ASSUMES A PERFECTLY FLAT PISTON WITH NO DOME OR DISH. THE LS WE USED HAS A PISTON DEPTH OF FIVE THOUSANDTHS IN THE HOLE, AND WE'LL PLUG THAT NUMBER INTO OUR VOLUME EQUATION. THE RESULT IS ONE POINT ONEZERO CC'S. 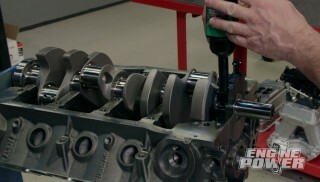 THE FINAL MEASUREMENT IS PISTON TOP VOLUME. NOW IF IT HAD A DOME IT WOULD TAKE WAY VOLUME OR IF IT HAD A DISH OR VALVE RELIEFS IT WOULD ADD VOLUME, BUT SINCE OUR LS PISTON WAS COMPLETELY FLAT WE DON'T NEED TO MAKE THIS MEASUREMENT, BUT IF IT WAS NOT WE WOULD MEASURE IT THE SAME WAY WE WOULD MEASURE A COMBUSTION CHAMBER. WITH ALL FIVE VOLUMES KNOWN SIMPLY ADD THEM TOGETHER. THIS IS THE TOTAL VOLUME AT BDC AND IS THE NUMERATOR IN OUR EQUATION. NEXT TAKE THE SAME NUMBER AND SUBTRACT VOLUME ONE FROM IT. THE RESULT IS THE VOLUME AT TDC, AND IT BECOMES THE DENOMINATOR IN OUR EQUATION. NOW DIVIDE THESE NUMBERS AND YOU HAVE THE COMPRESSION RATIO FOR YOUR ENGINE. OURS IS 12.06 TO ONE.